Discover the Horizon – Focused at and beyond security with our decentralised technology combining visual, thermal, sound and sensor data to better protect your environment. With MOBOTIX, you benefit from our open application interfaces and soft are development kits that allow you to create intelligent end-to-end solutions. Extend your Senses – Designed for intuitive operation assisted by artificial intelligence that’s ready to solve even the most challenging problems, with MOBOTIX you benefit from intuitive design and simple operation that removes the need for complex management processes. Create the Future – Our research and development leads the industry blending current and futureproof technologies into solutions that solve today’s challenges while ready for the next generation. MOBOTIX engineers working on advanced areas such as Light Detection and Ranging (LIDAR) and Machine Intelligence are leading the industry in automated incident detection. Designed to Last – Built in Germany with a focus on engineering excellence, our futureproof devices offer industry leading reliability tested against the toughest International Electrotechnical Commission (IEC) standards. With lowest in class energy consumption and meantime- before-failure (MTBF) of over 10 years of continual use, MOBOTIX offers extended value through proven design, quality component and extensive quality control. Secured for Life – With the rise of Internet connected devices offering a major target for cyber-attack, All MOBOTIX hardware and soft are is independently and continually tested by third party digital security experts to ensure proven protection against cyberattack. By maintaining soft are development and testing in-house in our secure facility in Germany, MOBOTIX leads the industry in cyber security for video surveillance ecosystems. More with Less – Our innovative decentralised concept allows you to protect larger areas using fewer cameras without complex or expensive control rooms. 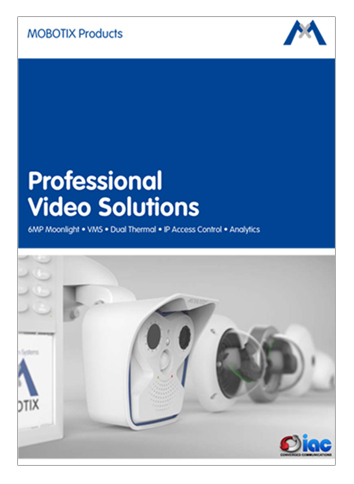 Together with our specially created MxPEG compression technology designed for video surveillance, MOBOTIX significantly reduces network bandwidth requirements without the sacrificing quality of individual image frames.